This is the first in a new IDF Armor series from Desert Eagle Publishing in cooperation with Legend Productions well known for their many resin update and conversion sets for IDF Armour. The soft cover book has 62 pages entirely in colour with English text much in the same size and format as the Concord book series with this issue No.1 featuring the MAGACH 6B GAL (M60A1) part 1 with part 2 following shortly. The text is kept to a minimum with a five page introduction and the remainder being for the photo captions which are quite comprehensive with the vast majority of pages having just two photos each with some others having three and four photos making them large enough to show off the vehicle details nicely. 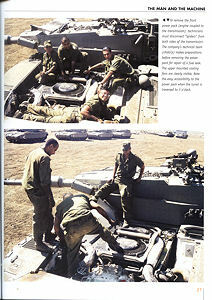 The books begins with the five page rundown on the Magach series from the Magach 3 and 5 based on the M48A1-A5 through to the Magach 6 and 7 based on the M60A1-A3. The next section on pages 9-19 features the 6B GAL in action with all pages having just two photos per page with semi-close up shots of the Magach on manoeuvres in desert settings. This is followed by pages 20-31 sub-titled “The Man and the Machine” and concentrates on the crews and their uniforms with some good close-up shots of the tanks and crews in their hatches and performing the many tasks needed to keep the tanks running including a sequence replacing the track. The next pages 32-52 has a series of close-up walkaround photos of the 6B GAL with excellent shots of the turret exterior showing some interesting differences in fittings such as the armoured housing for the main sight plus the weather sensor added to the rear turret. The gun mantlet is shown from various angles as are the large square smoke grenade launchers as well as the crew hatches and large rear basket. 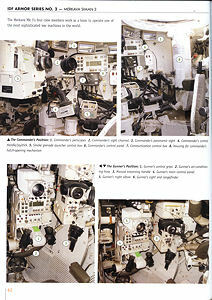 There are six pages devoted to the MAG and .50cal gun mountings with close-up shots of the mountings again from various angles supplemented with line drawings of the mounting components for excellent details and there are two pages with turret interior shots. 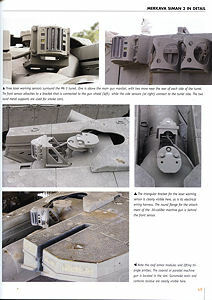 The next page has close-up shots of the KMT4 mine roller mountings followed by five pages with detailed shots of the power pack both inside and outside the tank for some very detailed views. 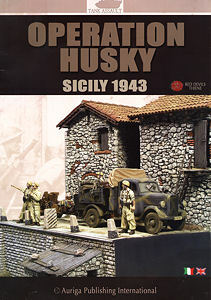 The following three pages is devoted to the tactical markings carried including the various styles of ‘Tsadi’ numbers (licence plate numbers) and dimensions of the main tactical signs plus the barrel battalion markings. Pages 56-62 are devoted to modelling the Magach 6B GAL featuring a number of Legends detail sets added to the Academy M60A1 kit with images of the assembled kit with the resin and etched parts added plus a step through of the painting and weathering process. This is an excellent reference for anyone modelling the Magach 6B GAL with detailed walkarounds along with shots of the tanks in the field giving good views of the storage and weathering plus the crew uniforms. 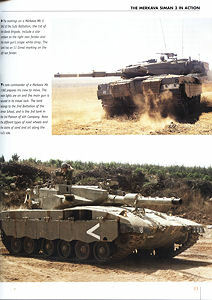 This series should be welcomed by IDF fans as well as those interested in Modern armour in general. Thanks to Legends Productions for the review book.